The family of Geraldi Mathambwe called me several times to ask me for help which I could not provide. 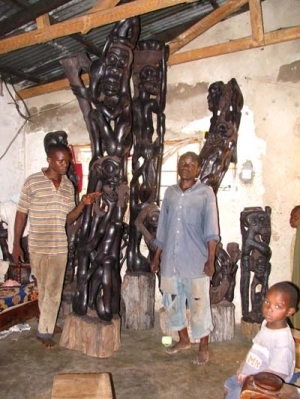 The Makonde sculptors share the hard life with those poor Tanzanians who can´t afford simple health care. The Mathambwe sculptures may get better life in air conditioned museums and collectors houses. They will never die, at least in comparision with our short lives. 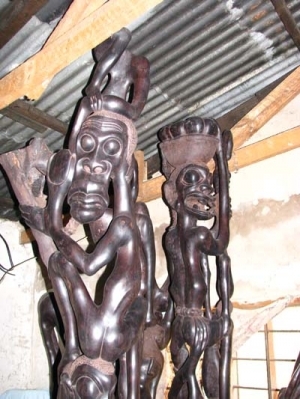 Only the success of his old friend, Makonde sculptor Bernard Pius, brought to me some degree of solace. Geraldi Mathambwe worked closely with him in studio in Dar es Salaam near Tazara (the railway station) and I have met them many times. I left always more fresh and more optimistic. The guys were great, there art were great. Enjoy the photos (click on the gallery) from my last visit from Geraldi Mathambwe´s studio on 9th July 2009. Now Bernard Pius studio. The Makonde scultptors expirience hard times. If you buy their art you will help them and their art to survive. Please contact me, if you are interested.